This is a beautifully furnished and remodeled condominium with new granite counters, & back splash in the kitchen along with a gas range, slate floors, tasteful and warm wood accents throughout. Location and ambiance combine for that perfect home away from home feel with all the majestic beauty Tahoe has to offer just out your door. 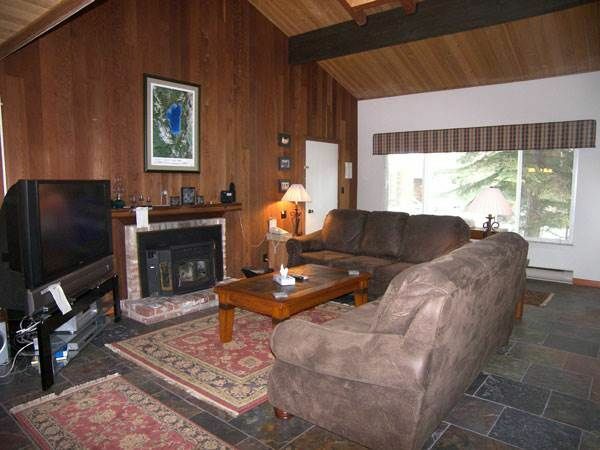 Enjoy a glass of wine or cup of cocoa in front of the fireplace. Fire up the grill and enjoy the beautiful Tahoe pines from your deck. The outdoor swimming pool (summer only) and hot tub & sauna in the clubhouse are a favorite way to have fun and relax. A short walk from the condo you will find Incline Beach, Hyatt Regency, many restaurants and shops, the skate park, disc golf, recreation center and Village Green park just to name a few. This is the perfect vacation spot whether you want to spend your time relaxing or on an adventure, it is all just a quick walk or drive away. You deserve the best, make this your vacation home today! Forest Pines is on the Diamond Peak free shuttle route. Incline Village boasts two private beaches, one with boat launch and the other with outdoor pools for adults and toddlers. Both have play structures, volleyball nets, picnic tables & snack bars. Daily use fees apply at beaches. For the skiers and boarders, Diamond Peak is a 5 minute drive with spectacular lake views. Shuttle buses are available to other nearby resorts. There are two eighteen hole golf courses. Ask us about discounts! The Championship course has a new club house & restaurant, pro shop, bar, snack bar, driving range and putting green. The community rec center includes an indoor pool,gym, basketball court,fitness classes, tennis courts & child care facility & children's swim and adventure programs. World class hiking and biking trails are in abundance in and around the village. Stayed with a small group of 5 for a ski trip, more than enough space for the group but not enough hot water for everyone to shower. The water boiler must be on the small side. Had to spread out showers past 11pm was not ideal. Location is good. Picking up the key at a second location was an added effort, but the process was simple -even after hours. Odd thing that happened to us - we came home from skiing to a squirrel in the house. We believe it may have been living in the attic and fell out of the light fixture as it was stuck in the shower. We carefully caught him and relocated him outside. No big deal and made for a bit of excitement. Overall, solid place, just a bit pricy after so many added fees and for having to deal with the hot water issue. Overall we liked the place. Big living room/common area - really nice for family/friends to get together. We were unfortunate to come in week when all their fire alarms needed battery replacement, and were eager to let us know in the middle of the night :( (multiple nights). Additionally, we had trouble keeping the house in comfortable temperature range (it would get too hot all at once). Vacation Station was rather slow to respond, but they did come and fix issues with fire alarms eventually (after 2 visits).